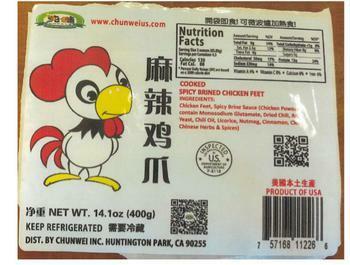 Chunwei, Inc., of Huntington Park, Calif., is recalling approximately 65,023 pounds of various ready-to-eat and raw meat A l;and poultry products. The products may contain soy, wheat, dairy, egg, and sesame, known allergens, as well as monosodium glutamate (MSG), which are not declared on the finished product label. A list of the recalled items, produced from November 16, 2017, through November 19, 2018, may be found here. The recalled products, bearing establishment number “EST. P-8110” or “EST. 8110” inside the USDA mark of inspection, were were shipped to retail locations nationwide. Consumers with questions may contact Yibin Huang at (626) 278-8199, or by email at Yibin.Huang@chunweius.com.